Behold: my version of a Valentine's Day date night outfit. Mom Life, am I right?? We probably won't be able to squeeze in a date this year but I will be rocking my Mom Duties so I put together a little outfit that will keep me festive while I volunteer at the preschool Valentine's Day Soiree. Dark wash, skinny leg denim that holds in my tummy, a grey v neck tee and this open front, striped cardigan are in constant rotation - mostly because all of it can be machine washed when Georgia undoubtably spits up all over me. 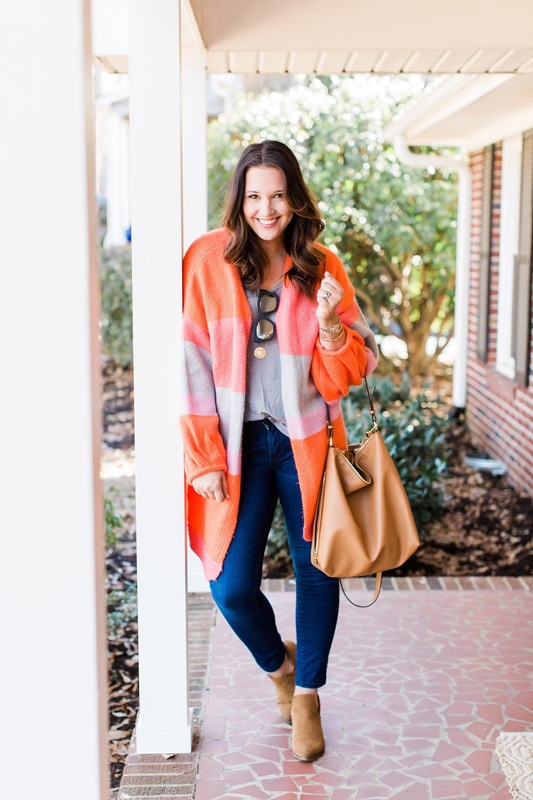 In my humble opinion, the open front cardigan is the most versatile, practical and stylish piece in any Mom's wardrobe. Bold statement, I know, but hear me out: what other piece can be popped over your pajamas and make you feel put together? 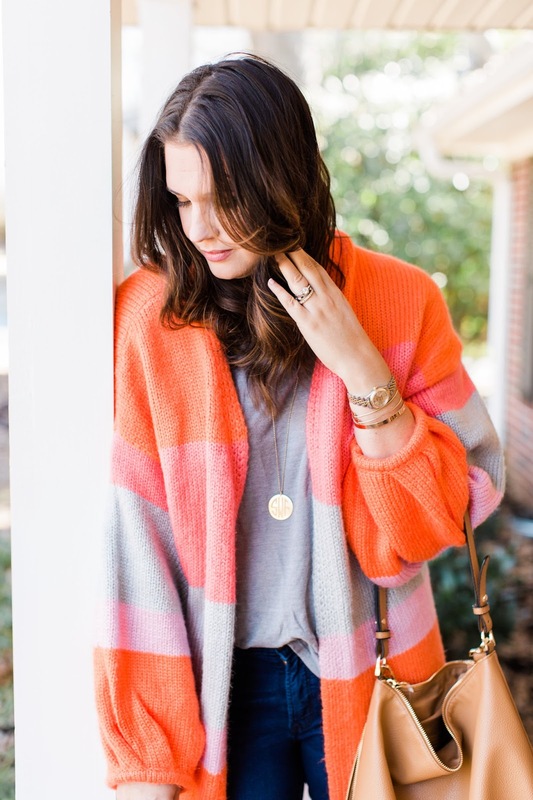 Nothing fits the bill for me more than an open front cardigan. 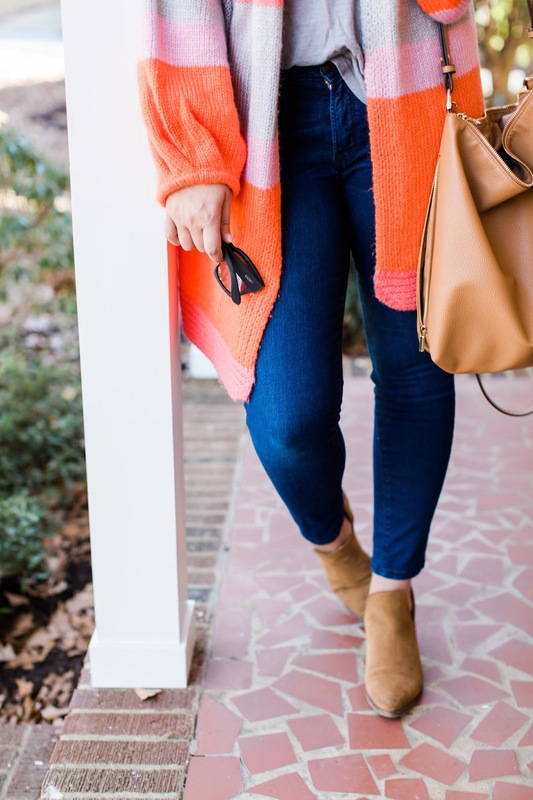 I have many in my wardrobe - super chunky knits that are cozy, light and airy cotton blends that are perfect for the transition to spring and belted cardigans that are perfect for Fall. Pair an open front cardigan with a tee shirt dress for cool summer nights or slap it on over a pair of leggings/sweatpants and your pajama tee for the run to preschool drop off - what more could a girl ask of an item of clothing? A note on the sweater I'm wearing: it runs large - I did not size down but I would if I ordered again. I'm tall (5'9") and the sleeves come down past my wrists, so if you're more petite than I am, go ahead and order a size down! 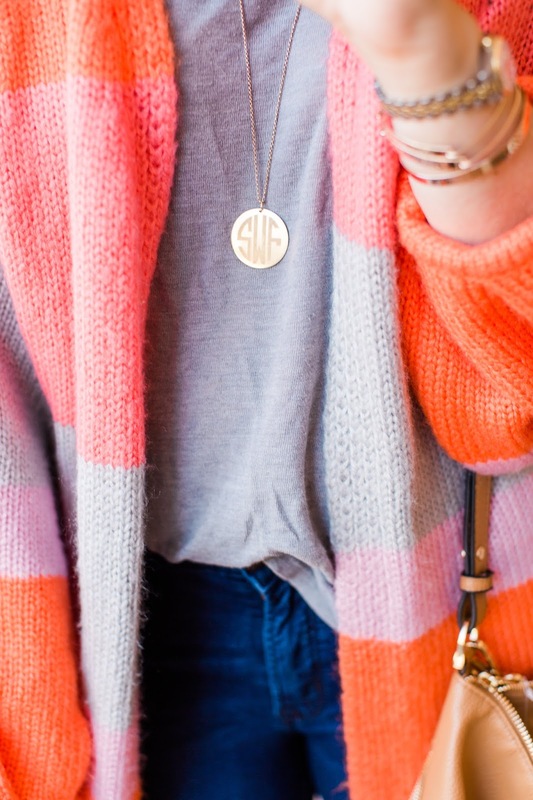 So cute, and I love that monogrammed necklace! I'm right there with you about a mom uniform! Thank you! I honestly wear that necklace every single day, it's just the easiest piece and so well made! No link to that adorable necklace? I want!! !